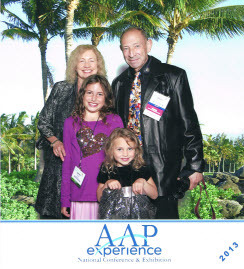 Dr. Fierson was accompanied by his wife Carolyn and granddaughters at the American Academy of Pediatrics. His main work at this meeting was to work on Foster Care and the Retinopathy of Prematurity paper due to be published in Pediatrics. Dr. Fierson spoke on November 16, 2013 about Remote Screening for Retinopathy of Prematurity (R.O.P.) at the Pediatric Subspecialty Day at the American Academy of Ophthalmology in New Orleans. R.O.P. is a disease in premature infants that must be screened carefully and then, if found, treated quickly. In his talk, he said that remote screening for R.O.P. is useful for Neonatal Intensive Care Units where there is no qualified screener available. He also said there is a problem with the quality of the pictures that are given to the remote screeners and the problem with emergent care of the infants when the pictures show that the patient has R.O.P. Dr. Fierson is the lead author in a paper about Remote Screening of R.O.P. due to be published in Pediatrics in the next few months. Dr. Fierson is also the lead author of the four policy statements published by the American Academy of Pediatrics. The latest statement can be found on the A.A.P. website or Pediatrics, Vol 131, Number 1, January 2013 p. 189-195. 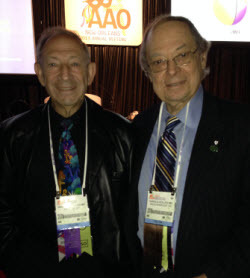 On February 28, 2011, Dr. Walter Fierson together with Dr. Sheryl Handler published their “Joint Technical Report-Learning Disabilities, Dyslexia, and Vision.” Pediatrics 2011;127;e818-e856. The authors state “dyslexia is a language based disorder.” They also state: “Visual problems do not cause dyslexia. Scientific evidence does not support the efficacy of eye exercises.” They recommend: "Early recognition and individualized, interdisciplinary management strategies are the keys to helping children with dyslexia.” Lori O’Keefe reviewed Drs. Fierson and Handler’s Technical Report on Learning Disabilities” in the March 2011 issue of Pediatrics. The article is entitled: “Crystal Clear: New A.A.P. Report Backs Up Earlier Policy Debunking Vision Therapies in Treatment of Learning Disabilities. A.A.P. News March 2011;32:18. “Learning Disabilities, Dyslexia, and Vision” which can be found online at www.pediatrics.org/.